One of the greatest things about fabrication processes is that they can be shrunk. 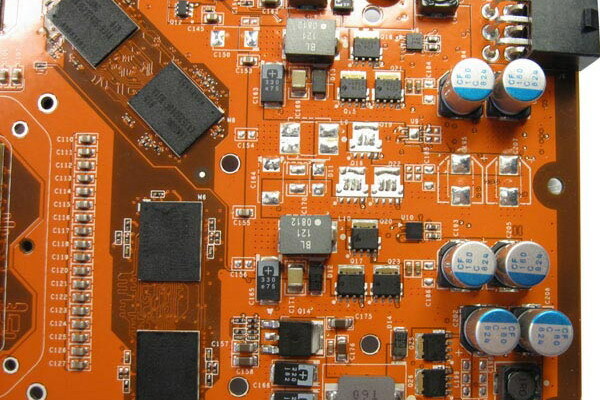 Assuming that your architecture is forward-thinking enough, and it navigates issues with power plane-mapping and transistor leakage and all that, you can take your design, make it smaller, run it faster, and use less power. 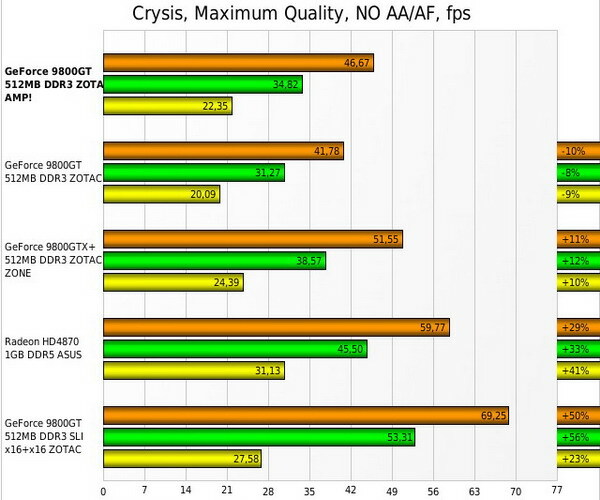 ATI has reaped great successes going from 65nm to 55nm, and NVIDIA is going the same way with their G92 parts. This process will take their 8800 GT, an excellent performer at the time of its release, rename it 9800 GT, and reap away. I mean, that would be the way to do it if you wanted to make any sense whatsoever. Because this is a regular ol’ 65nm part. This naming debacle, as frustrating as it is, belies some real amazing progress. 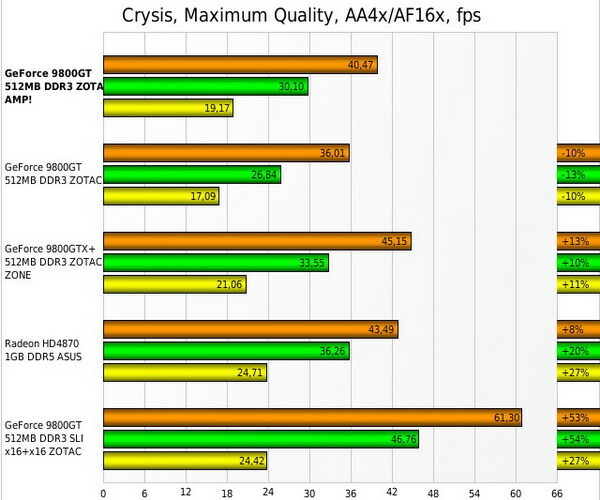 And I’m not talking about the addition of HybridSLI to the 8800GT, and certainly not triple-GPU SLI (because you can’t do it with this excellent card, and if I knew who’s brilliant idea that was, I’d tell you now) or any of the other subtle advantages 98 has over 88. 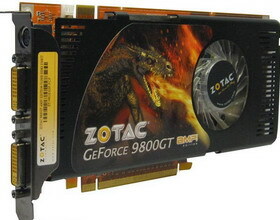 The progress is this: when the 8800 GT was released, it cost about three hundred dollars. One year later, games aren’t more demanding, but it can be had for close to a Benjamin. 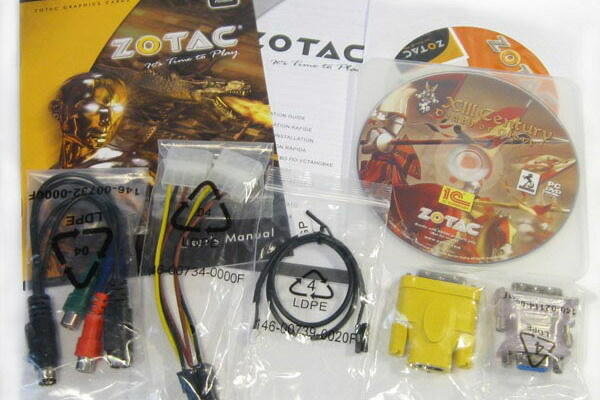 But Zotac doesn’t stop there, they take a well-binned example of G92 prowess, overclock it, and give you a copy of XIII Century: Death or Glory for your trouble! Did I mention it only costs $120? This card uses the same single-slot heatsink NVIDIA’s been using all year. It’s modified from last year’s single-slot heatsink with a bigger fan and fan opening for quiet cooling. While it’s easy to associate single-slot with ineffective, this reference Cooler Master design has been a reliable source of peace and quiet. 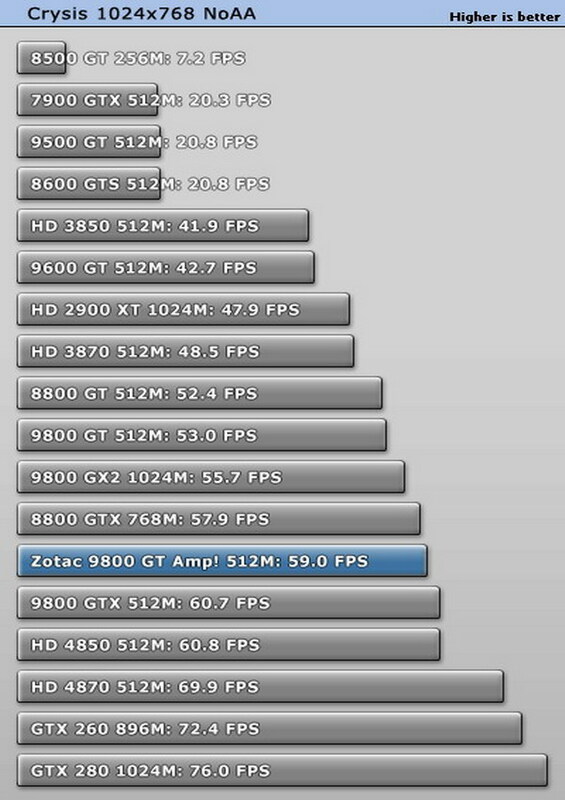 Now, with a card overclocked like this example, we’ll see. 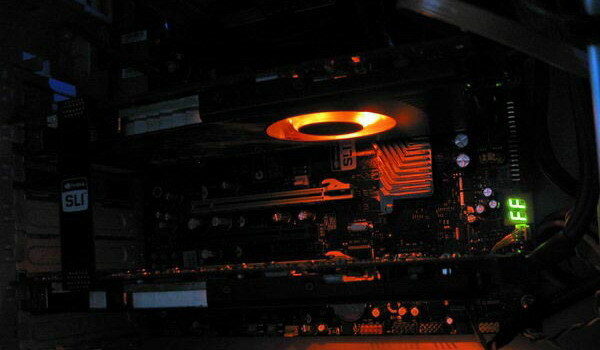 The heatsink is black, but the PCB is a nice navy blue–I first thought it was black, in my torch-lit cave. All of the design is reference, and the card is nondescript compared with other mainstream cards of the current generation. The sticker’s got a dragon on it. Not a wench riding a dragon, nor a dragon huntress. 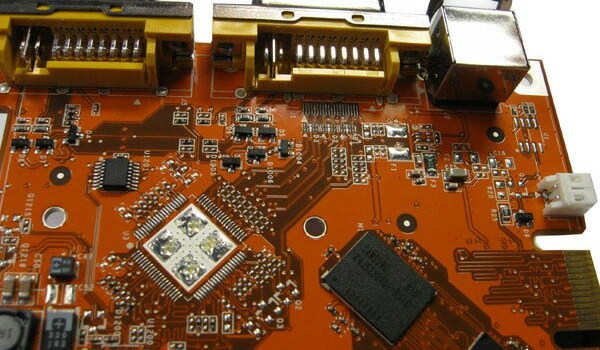 If there wasn’t an SLI connector at the top, along with a single 6-pin auxiliary power connector, you might not know that it was, in fact, a video card. Without cheesecake, not even the dual-DVI connectors would grant that insight. There’s a familiar bundle, complete with video breakout cable (component and s-video) VGA and HDMI adapters, audio patch cable (for audio over HDMI) 4-pin-to-6-pin Molex adapter, manual, driver disk, and XIII Century game disk. All cards were benched on the same test platform with the recent drivers (April or newer). 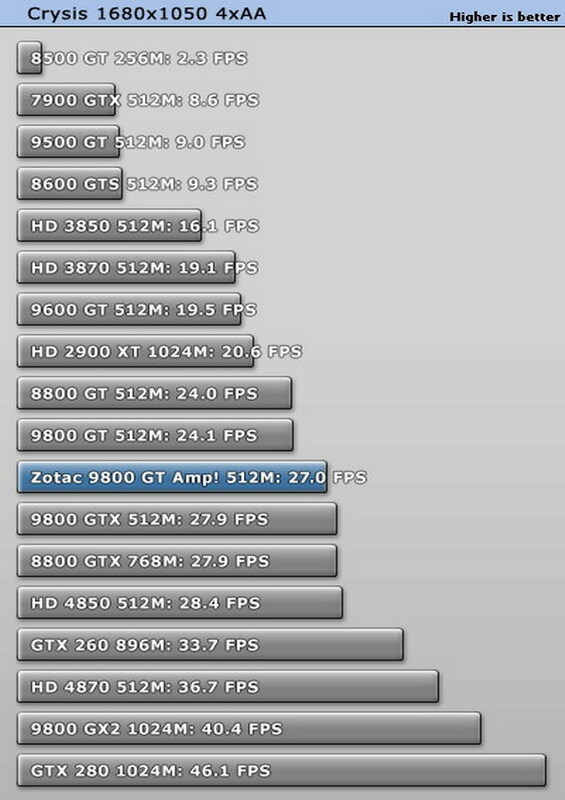 Step into a world of high-performance graphics and brilliant visuals with the ZOTAC GeForce 9800 GT AMP! 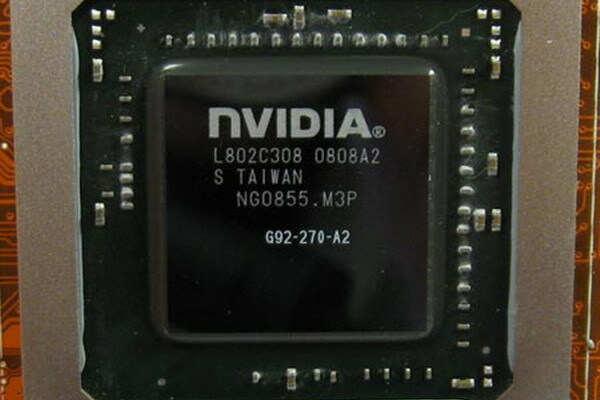 Edition, backed by NVIDIA Unified Architecture. 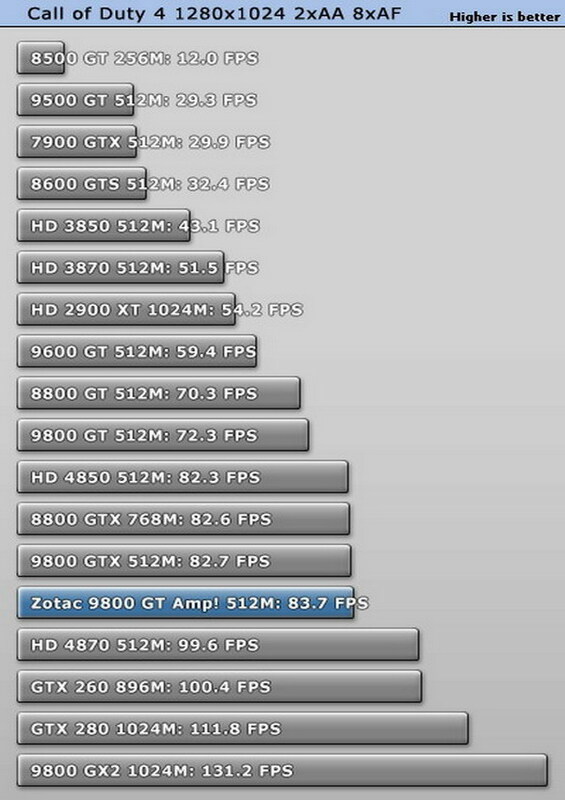 With it’s 112 overclocked processor cores, the ZOTAC GeForce 9800 GT AMP! 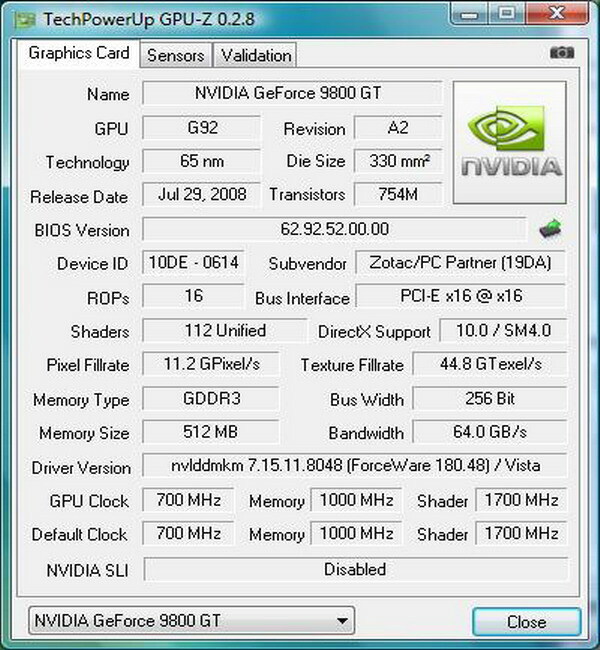 Edition gives the NVIDIA GeForce 9800 GT graphics processor an additional boost in performance and delivers smooth frame rates with life-like visuals in the latest DirectX 10 and OpenGL 2.1 enabled 3D games and applications. 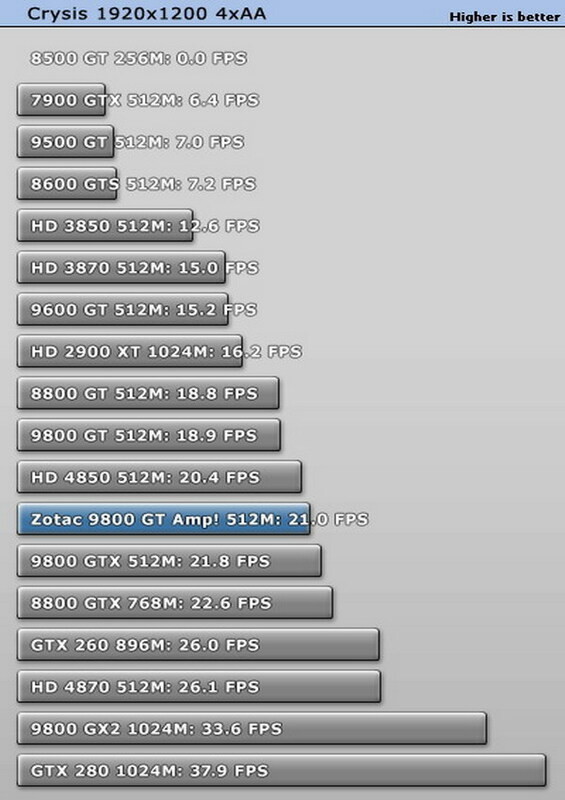 NVIDIA PureVideo HD technology joins the additional performance, allowing the ZOTAC GeForce 9800 GT AMP! Edition to deliver a premium high-definition video playback experience with hardware decode acceleration. PureVideo HD technology also enhances standard-definition content such as DVD to near-high-definition levels of visual quality, for a premium home theater experience. 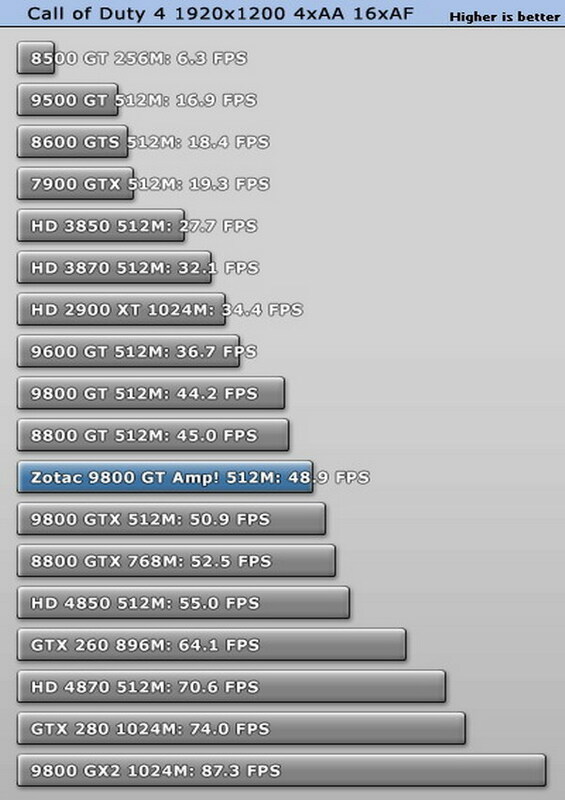 You can see this card trailing the GTX by a frame or two all the way. 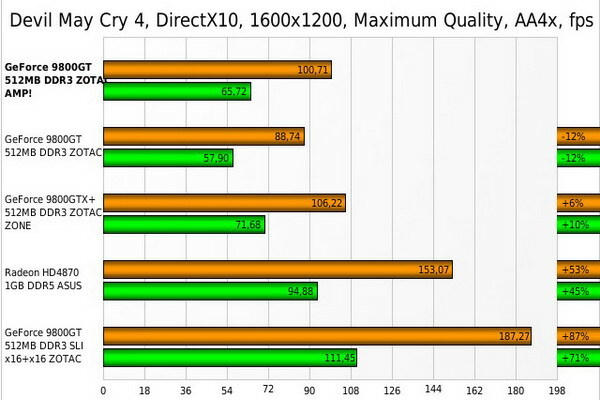 At high resolutions with anti-aliasing enabled, the gap narrows. 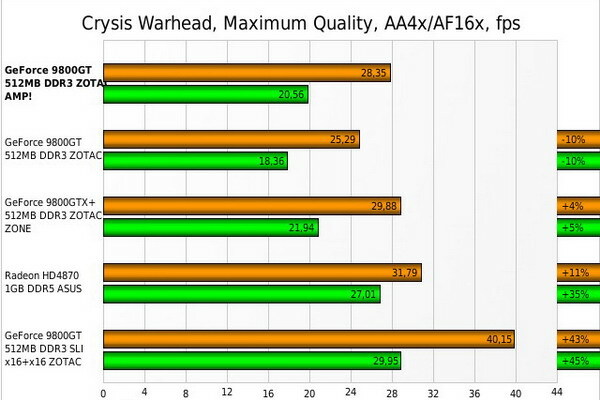 It’s wholly competitive with Sapphire’s more expensive 4850 Toxic. Second verse… This overclocked GT is right behind a GTX. 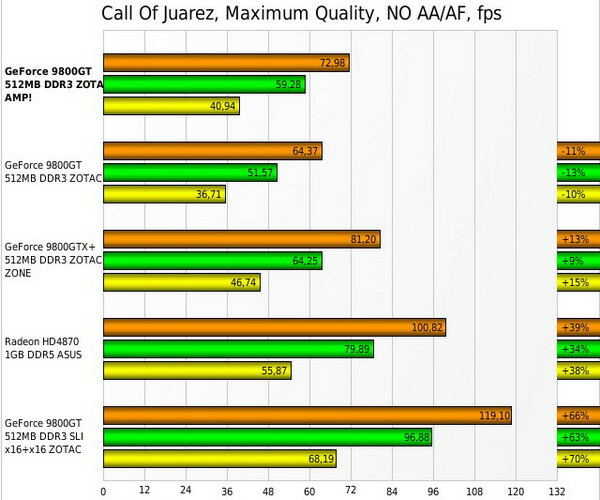 There’s absolutely no way a user could spot the difference between this GT and a GTX without benchmarks. 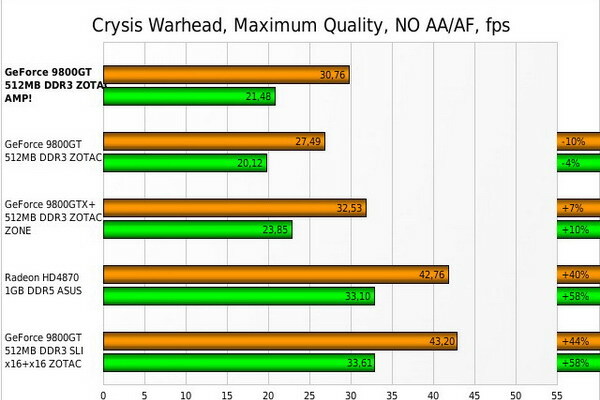 NVIDIA’s attention to OpenGL pushes this card past a 4850 in Quake Wars performance by a significant margin. Here, the part shows it’s G92 roots, with not-perfect SD video noise reduction. 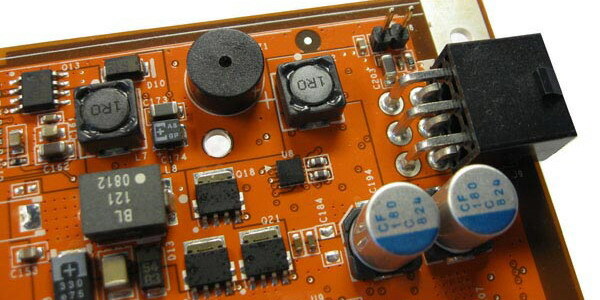 It’s still very good, and probably worth it once you see its power consumption. 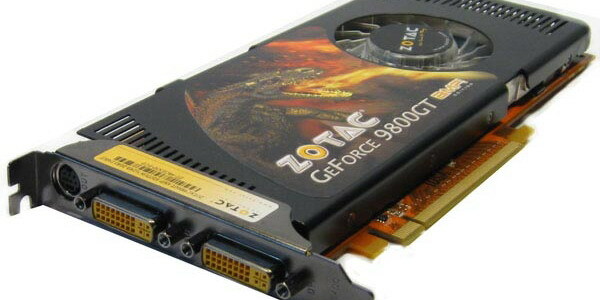 This 9800 GT doesn’t even pull the 150W available to it from a PCI-Express 2.0 connection. (That doesn’t mean you should run it without the auxiliary power connected.) 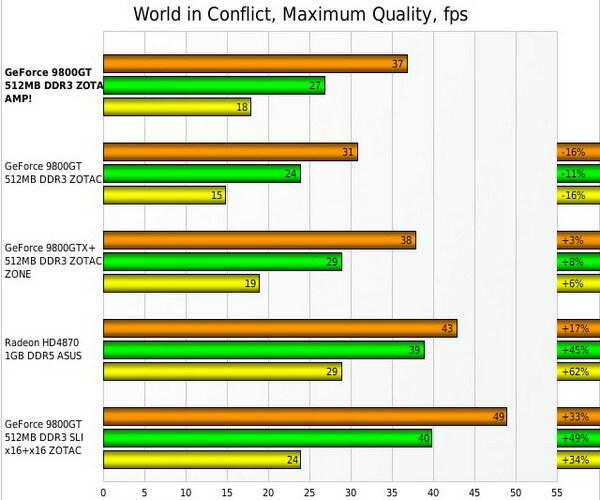 It’s better than a (heavily overclocked) HD 4850 in that respect, with performance about the same. It’s not surprising, then, that the heatsink isn’t noisy or obtrusive. No one would call it silent, or at times, even quiet. After an hour of load, with the temperatures around 75 degrees, the heatsink was being worked pretty hard, with the fan at 70%. But the character of the fan is low-key, even at its highest speeds, with no abrupt shifts in tone as the fan speeds up and slows down in single-percent intervals about once per second. 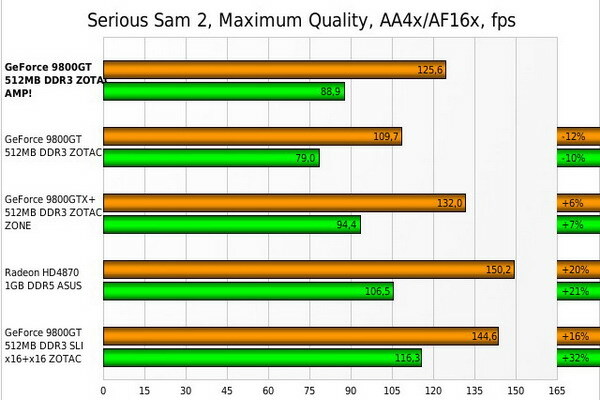 There wasn’t a whole lot of headroom when I got to overclocking this card, less than ten percent. 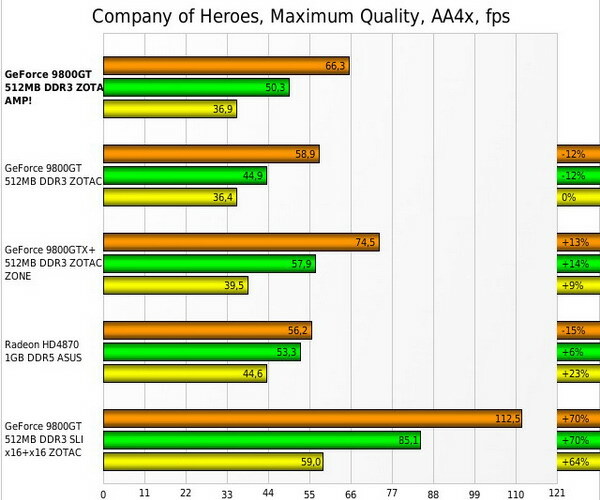 But a 60MHz OC on the GPU on top of a 40MHz stock clock, well that puts it about 15% faster than a regular card. 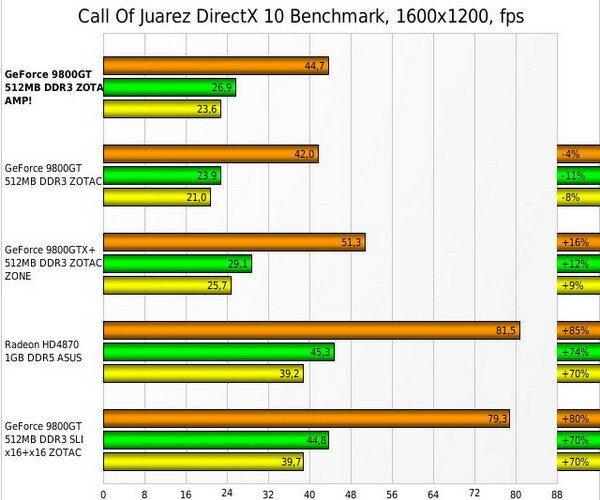 The performance gap between this 9800 GT and an overclocked 9600 GT is about an order of magnitude, which, seeing how the prices overlap, really makes me wonder if there’s any room left in the market for the lesser budget card; really, the 9600 GT maintains undesirable traction–don’t bother with it, get a 9800 GT. 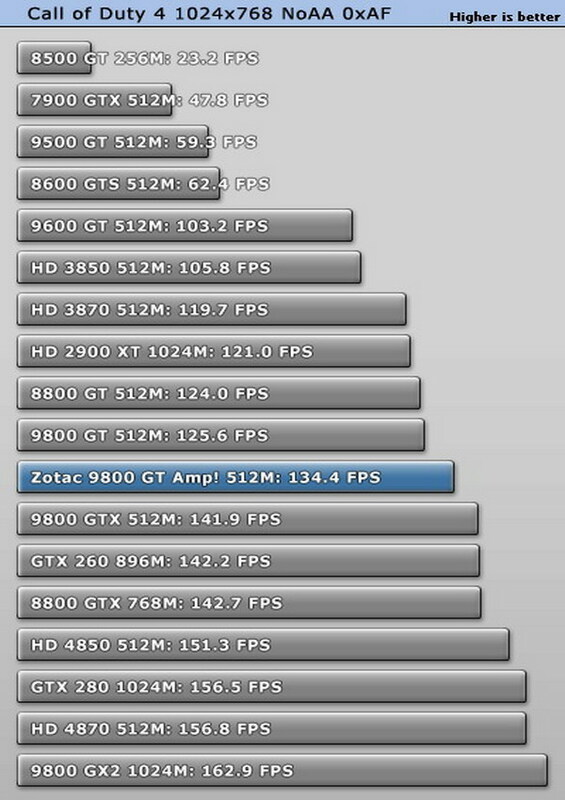 Game tests have Zotac’s AMP! 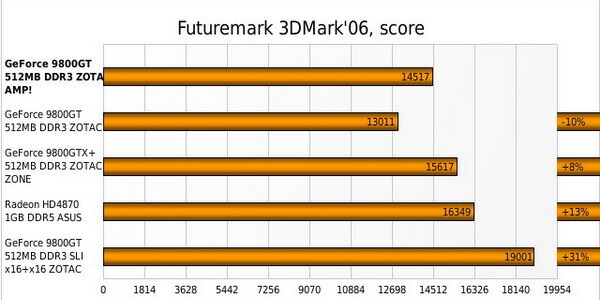 sticking with a 9800 GTX and even putting a good fight against Sapphire’s Toxic 4850, all the while, consuming less power, making less noise, and in general, being cheap. 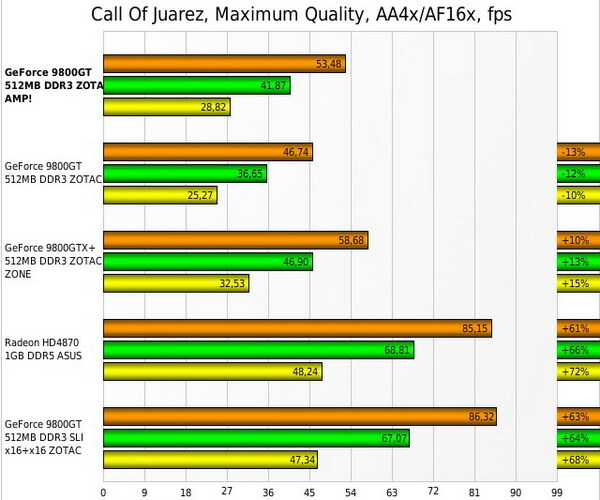 This makes the 9800 GTX appealing only for the triple-SLI crowd; an unusual demographic at best. 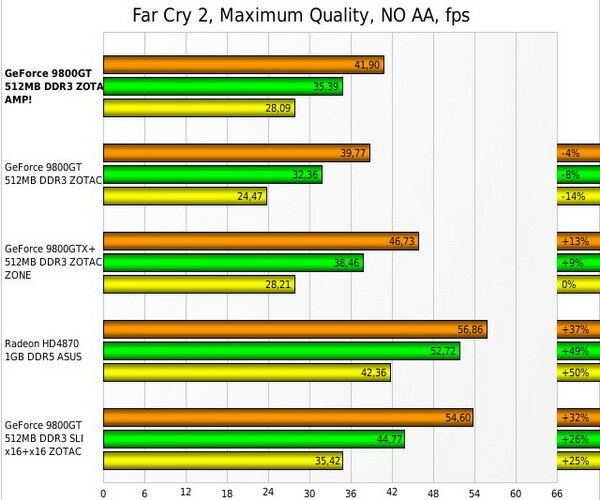 Really, there’s no reason to buy a stock GTX over an overclocked GT such as this, unless you’re dead-set on spending too much money and using too much power. Zotac includes all the mandated accessories and even throws in a game that I’d never heard of until I benchmarked this card. 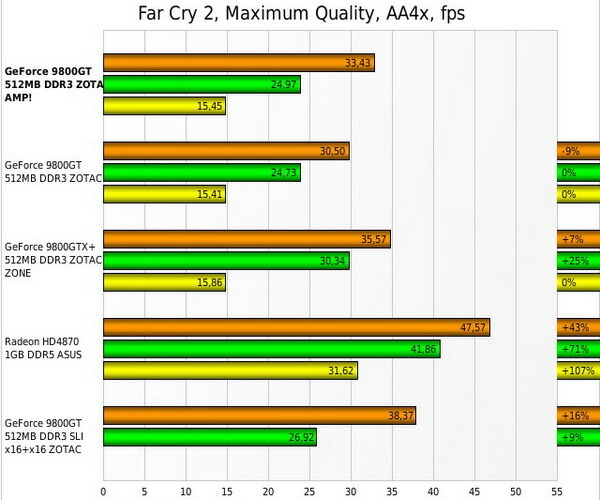 For any mainstream gamer, the obvious choices have been HD 4850 or 9800 GTX. Zotac’s card simply removes the X, an act I wholeheartedly endorse. 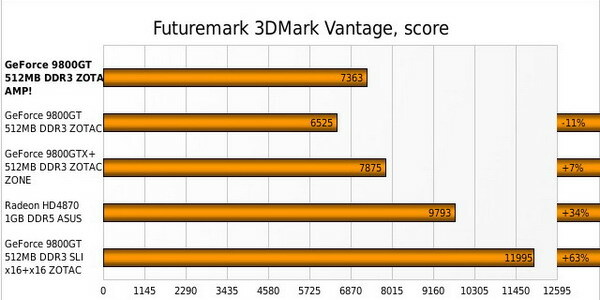 A final note to hardware geeks – I’ve noticed on a lot of hardware forums that people are still recommending the 8800GT to one another. 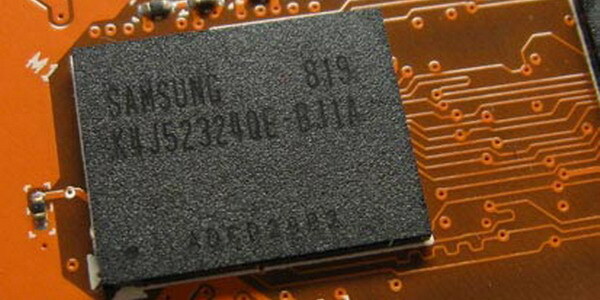 The 9800GT is based on the same core, but it’s on a newer, more efficient process. So if that’s the route you’re going for, go for the 9800GT. For some reason (defying all logic), the 8800GT is still selling for about $50 more than the 9800GT. It boggles the mind.